February 22, 2010 The Wadakkunnathan temple stands in the heart of Thrissur, the cultural capital of Kerala, a peaceful abode of Siva around which life flows in its mundane course. A nritta sangeethotsavam in connection with Sivarathri in the temple precincts has become an annual feature for the past many years. The ten-day function organized this year saw local artistes, amateur groups, and established artistes paying their tributes to the Lord. Two of the remarkable dance performances merit special mention. Tyagaraja Ramayanam and Geethopadesam by the acclaimed dancer, Dr. Ananda Shankar Jayant were solo performances. She painted the familiar story of Ramayana's sublime colors. The turning points in Lord Rama's life flit past as if in cinematic clippings. But the perspective changes the cast, in a superb manner, giving a spiritual aura to the legend that has dominated the subcontinent and travelled to the Far East. The story of Ramayana is told from the artist's perspective. Tyagaraja, the saint composer is known for his devotion to Lord Rama. The body of work he left behind is a proof to his unparalleled devotion to Rama. Nurtured in the traditions of devotion, visions of Rama inspired the composer. Life of Lord Rama as Tyagaraja saw, lay in his compositions. What led the dancer to adopt such a stance of looking at the Ramayana may be personal. The dancer, Ananda, rising like the phoenix from the throes of mortal illness, must have had such visions, which she paints on stage. A confrontation with death casts the understanding of life and its values in a different light. Tyagaraja Ramayana is a compilation of Tyagaraja kritis embroidered with slokas from Valmiki Ramayana for continuity. The turning points in King Rama's story, has an ideal halo to an Indian mind. On stage, it acquires a symbolic dimension from the poetic angle; reaches a philosophic height from a devotee's perspective. Hence the multi-faceted piece is a sublime production of the human, the heroic, and the divine aspects of Ramayana. The solo consists of two parts: the first depicting scenes up to Sita Kalyanam and the second from Paduka Pattabhishekam to Maha Pattabhishekam. The first scene is that of Rama the infant, Kausalya's beautiful baby born on an auspicious day. The endearing mother-child bond of love, care, exasperation, anxiety, and joy is the highlight. It is when Tyagaraja asks, "Am I worthy enough to see your beauty, oh, Sri Rama…," we recognize both the human and the divine perspectives at one go. The second scene is the turning point in the life of a Prince: his duty to protect his subjects even at a tender age. Sage Viswamitra takes the young boys, Rama and Lakshmana, to the forest to put down the menace of demon Thadaki. The accent on dharma is the core of Indian philosophy. And Lord Rama's fate is cast at this point: the negation of the personal for the people of his kingdom. The vigor of the battle scene is a contrast to the first scene of maternal care and love. The scene of Siva Dhanurbhangam holds a mirror to male vanity. Fear, surprise, despair, defeat, and sense of shame writ large on each face form a parade of vain, glorious kings. And in contrast, we see the humility and nobility of the handsome Rama. Yet, even for such a prince, marriage must be a challenge. Life is under-writ in terms of trials and tribulations. Or thy paduka worshipped by Bharata greater? The disfigurement of Surpanakha is central to the story of Ramayana. Soorpanakha is a foil to Sita. Two aspects of womanhood in relation to man, and the joys and anxieties of matrimony is brought out. Then comes the tender scene of Sabari's love drenched in innocence, really rare. And Rama accepts the fruits, and comforts the old hunchbacked woman like a grown, lovable son. The interpretation of Bali Vadham to which credit goes to Tyagaraja was a surprise. The one crime that Rama committed in his life is the manner in which he killed Bali. Here the eye is turned to Bali. God realization on the throes of death is so human. We become one with Bali to realize the futility of a life in darkness with a sense of tragic waste and despair. Karuna rasa dominates when the supreme mercy flows as death comes as a relief to Bali. Hanuman crossing the ocean and the building of Sethu is presented as a miracle that springs from devotion. The Rama-Ravan yudha, an archetype, is the quintessence of vigor and veera rasa. And the Pattabhishekam scene with "Vaidehi Sahitam…" echoing in the air is a joyous event in which even animals and birds take part giving it a universal touch. The benediction pose with which the piece ends made it aesthetically pleasing. The application of navarasa on an expressive face was the high point of the recital. Music scores to superb levels gave inspirational support to the dancer who enjoyed dancing with effortless ease. The accompanying artistes were nattuvangam: Renuka Prasad, vocal: Venu Madhav, mridangam: TP Balasubrahmanyam and violin: Saikumar. The skill, stamina and grace of Ananda is amazing when she immediately started another solo, Geethopadesam, to select verses of chapter 4 of the Bhagavad Geeta. Into the battle array comes the chariot: the prancing horses, the majestic charioteer Krishna, and a confident warrior Arjuna. Soon Arjuna is the shattered image of a weak human being. Scenes of his past rush into memory reminding how all these individuals in front nurtured him from his boyhood. The scene depicts human plight at the crossroads, its anguished moments. As Krishna chides, the stirrings of the Right wake up his conscience. Then comes the clarion call, to do the karma, do the dharma …. Kurukshetra is transformed into a dharma kshetra and Arjuna gets the primordial vision. The recital ends with Krishna, his revolving chakra in hand and a surprised Arjuna gazing… "Dharma kshetre… Kurukshethre..." ringing loud in the night air. What was missing on that day was a piece on Siva, considering the occasion was Sivarathri. And that was compensated on the eve of Sivarathri by Kavita Dwibedi from Delhi. Her Odissi recital concentrated on the legends of Siva and Parvathi. Kavita began with an offering of flowers invoking Nataraja, her Guru and the audience. Befitting to the occasion, it was two slokas from "Ravana-krita Siva-thandava sthotram" describing Lord Siva from head to foot, and in all his aspects. The thandava poses, tableaux-like, momentarily stood frozen in time. The two slokas revealed the power of devotion. The pallavi in ragam Saveri and adi thalam, a traditional piece of pure dance, painted the joy of dancing. With a graceful, charming expression the dancer is getting ready for a performance. We see accompanying musicians, integral to dance. The dancer strings a floral garland, decorates her hair; the earrings are in place; holds the mirror to see the reflection of her adorned face. And then flows a visual extravaganza of temple motifs interwoven with musical motifs. The technique of Odissi, the chauka and tribhangi, the sculptural poses that makes Odissi arresting, was a treat.. It was as if the stage had become a virtual land where the dancing sculptures of temples of Orissa came alive and musicians rose from its walls with their instruments creating a rhythmic chant. Konark and Puri came alive as in a dream. The dance recital started on a slow tempo and quickened in keeping with the rising excitement. 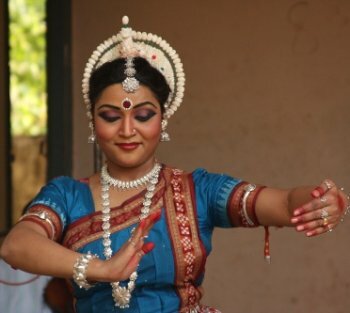 "Odissi is incomplete without Ashtapadi," said Kavita. And in Kerala, Ashtapadi is part of its ritualistic life. Ashtapadi began in Misrakapi ragam, adi thalam, Radha pining for Krishna, "Yamuna theere….." In this abhinaya piece, the sakhi narrates the plight of the lovelorn Radha - her physical, and emotional state in its allegorical interpretation, and spiritual dimension. And Krishna comes to the loving heart, how can he ever forsake anyone who loves him so much!! The last item was based on Adi Sankara's Soundarya Lahari depicting ashta rasa in ragamalika and thalamalika. Taking a single sthotra, the dancer presented a string of stories from Siva Purana illustrating each rasa both from the male and female ethos, a unique feature that has scope for abhinaya. Sringara is perhaps the most popular and charming in its rendition. Parvathi and Siva in an evergreen garden of flowers is a classical setting. The coy maiden and the handsome male frolicking under the greenwood tree in spring is a celebrated archetype. The sringara rasa in male and female are two sides of the same coin: Siva and Parvathi complement each other. Beebatsa is enacted using another story. How demons try to entice Parvathi and how she is disgusted with their efforts. The expression of both male and female is the highlight. Raudram, genuine anger, is the result of insult rather than jealousy. Parvathi finds out a hitherto hidden Ganga; anger surges. She asserts her right to question her Lord. Vismayam, surprise, for Parvathi, springs from the altruism of her Lord. He drinks poison to save all the beings of the world. With what pleasure he drinks!! What all encompassing love!! Bheedhi, fear, is just human. It is the fear of the snakes all around Siva that Parvathi finds difficult to cope with. Hasya too is very human, playful mockery seen on Parvathi's face as she plays with other maidens teasing each other. Veera, valor, shows both the female and the masculine aspects of the psyche. Durga is pictured as the epitome of power, both creative and destructive. Durga is Mother Goddess and Mahishasuramardhini, as well. The temples of Durga mark red as its color, the color of kumkum and that of blood. Karuna flows from Siva and Parvathi, the ideal couple, the ardhanariswara. Poised with abhaya and varada mudras, compassion flows from them to the hearts of humanity. And the devotees, worshipping the Mother full of Karuna enshrined in their hearts, are drenched in gracious, merciful love; Sivam reigning in thandava poses. And the overwhelmed devotees prostrating…. sivam, sundaram…The dancer too prostrated, tears flowing, the positive vibrations filling the air on the eve of Sivarathri. Kavita's accompanying artists complemented the recital. Vijayapriya on cymbals, Prasanth Behra on vocal, Jithendra on mardala, Pradeep Maharana on violin. The charm and ease with which Kavita danced made Sivarathri special for the devotees. The sanctity and the spirituality of the temple confines made the dance recitals haloed events.